This morning as I took my daily walk I thought about how really simple my needs are, and how when I embrace those simple needs I find happiness and serenity. It's a world where we are bombarded 24/7 by the media and the internet. It's a world where we feel driven to compete. It's a world that focuses on having and being more. Do all of those "things" really make us happier? I literally wasted two days earlier this week trying to find the perfect walking shoe or sandal. I would find a pair, bring them home, wear them around the house and realize they weren't comfortable. So back they would go to the store, where I would try another pair. I eventually gave up, put on my old shoes and set out on my walk. None of those expensive shoes made me happy. In fact the whole process was making me everything but serene. I felt frustrated and tired after two days. I realized that I need to recognize and embrace my simple needs. For me they are quiet spaces, good books, my indoor garden, healthy simple food, and the love of my family. Maybe as we age we realize that all of the bells and whistles of the world are just not as important as we once thought they were. What are your simple needs? Are you embracing them? P.S. I am now a regular contributor to Brenda's new blog At The Women's Room. You can find my first posting here. P.P.S. You can find more of the Rewriting Life series here. Hi Laura, I know about your frustration on trying to find just the right garment or shoes or whatever the case may be. Sometimes I think we are overloaded with too many choices of a particular item to choose from. Like I say, you can't even walk into a drugstore to get say, Tylenol without being bombarded by an entire aisle of pain relief items...different manufacturers, different formulas, tablets, gel tabs, liquid. My needs are pretty simple, too. I'm not the high maintenance type woman. I buy most of my clothes at thrift shops or else on clearance. (That is, when I even shop for clothes. I don't mind wearing the same clothes for years.) My car is over 14 years old and as long as it runs well, I'm all good with that. I have no desire for a new car. The only two "expensive" things I spend money on are getting my hair dyed (and the girl who does my hair is relatively inexpensive - plus I let it go a long time between colors) and weekly yoga classes. when I DO find something I like, that fits and appeals - I try to get another. Saves the tiresome of hunting for the next time I need one. Just replaced a handbag I wore out, after daily use for at least 10 years. I am striving to make my life so much simpler. At my age (63 today!) I want things to not be complicated or overly dramatic. 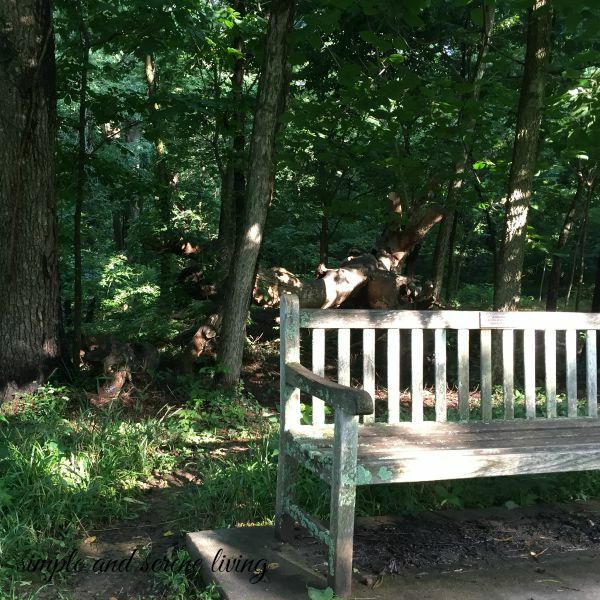 Slowing my pace, enjoying the natural world and touching God through it. You make such valid points Laura...I am not looking for flash, and glitter in life...just a few happy moments that I am smart enough to realize that I'm being blessed with. 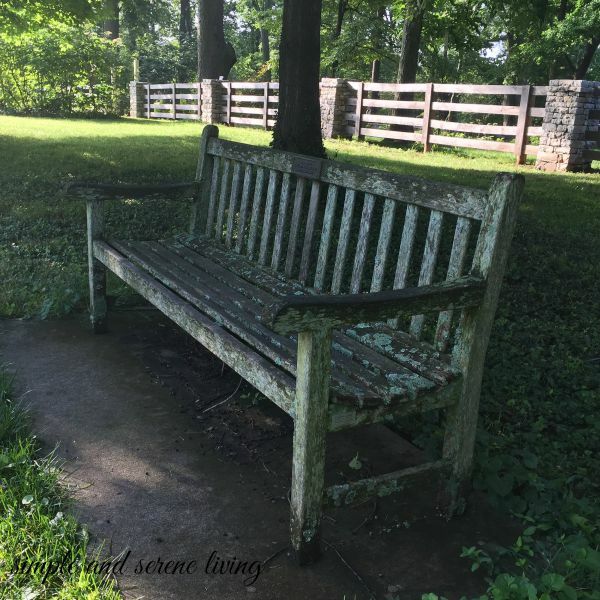 I'm in love with the patina of that bench...if it lived near me I would be there all the time with the camera....love your shots of it. I totally agree. I hate hate hate shopping for clothes or shoes. It's been so long I can't remember the last time I shopped. I want to tell you that I think you have truly found your "voice" now, and with every post, you help others and spread joy. I'm finding joy in the simple things these days too. I don't like to shop for anything for me, just a casual walk through a kid's store, a consignment shop or junk store makes me happy. I'd rather have a good book and a good cup of coffee than anything I know. I think it comes with getting older. I'm happier now that when everything had to be perfect. So true, Laura, that we do have simple needs and the world-at-large makes things complicated. As for me, writing is a simple need. Also, flowers, a good night's sleep, coffee in the morning, kisses from my baby granddaughter, regular meals and music. Oh yeah, and blogging plus enjoying my miniatures hobby. I have been enjoying the simple things in life for a few years now. 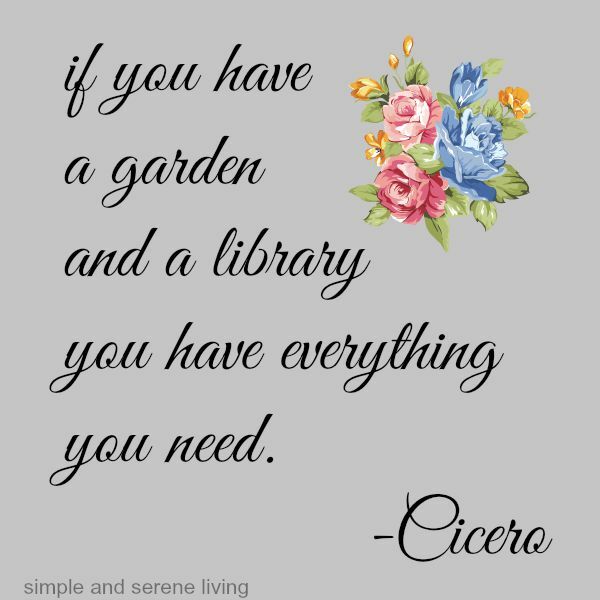 I love the quote about books and a garden and actually have it on my sidebar. Shopping can be very frustrating, especially in the clothing department. I wear my favorites all the time, but they do wear out and I have to drag myself to the shop and look for replacements every now and then. I really don't need a lot to make me happy. Give me some flowers, some good books, some music, my family and furbabies, and oh yes, my laptop and I'm quite content. Well, as long as everyone stays healthy. I couldn't agree more! I have definitely embraced the simpler life since I've gotten older (even though I'm not "old"). I remember being a working mom with a young child and having plenty of money for everything but being miserable. I finally quit and resigned myself to a simpler less stressful life and I haven't looked back. Hi Laura... I know what you mean about the walking shoes! I've been wearing the same New Balance shoes for years. I just order new pairs of them. Hope they don't discontinue them. Enjoy your week!